In the early 1960’s when many furniture designers such as Charles and Ray Eames Danish Verner Panton, Finnish-American Eero Saarinen and the Frenchman – Pierre Paulin, were experimenting with new materials like aluminium, fibreglass, plastic and rubber, Wegner chose to go in a different direction altogether. 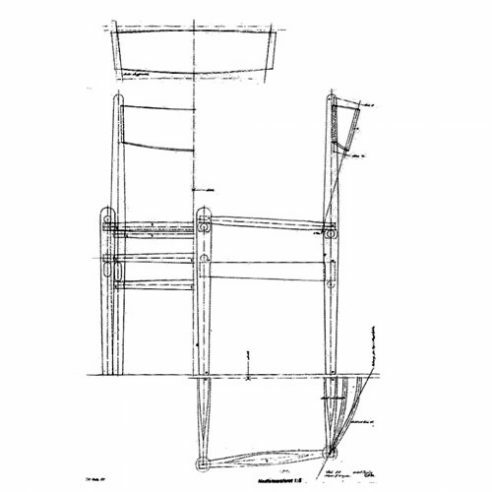 The dining room chair, CH36, was the first in a long series of Shaker inspired chairs that Wegner designed for Carl Hansen & Son throughout the 1960s. The Shaker, a religious sect in the United States, comprising of northern European immigrants had since the beginning of the 19th century have lived in small communities. from external influences the sect fostered a tradition of artisanship. Its members believed that the spiritual and temporal worlds meet in the things they build and surround themselves with. Therefore an object’s exterior must be modified as little as possible and be pure, unadorned and robust. It is for this same reason that an object’s function completely dictates its form. According to Shaker aesthetics, beauty is expressed in functionality. There is absolutely nothing superfluous about CH36. It is light, taught, rectilinear, with a woven seat and slightly angled back providing little opportunity to shift one’s sitting position. The underframe, strechers, legs and seat are quite reminiscent of the Wishbone Chair, another dining room chair made by Carl Hansen & Son, yet because of the Wishbone Chair’s open, round sculptural top, the two appear to be diametrical opposites.